Fresh produce and the bounty of the land (and sea) reign supreme. This article appears in print in the February 2018 issue, as part of the cover story, "The United States of Food." Click here to subscribe. Regardless of where we came from, we’re all here for a reason—and part of that is the fact that the West Coast is the best coast, right? Although we wouldn’t call Blackfish, Tulalip Casino’s finest dining option, a Native American restaurant, it is one of the only local spots where you can experience traditional Tulalip tribal cooking techniques, such as wild sockeye salmon skewered on ironwood sticks and roasted vertically over an open fire pit. This is how the Blackfish heritage salmon ($31) is prepared—fun to watch from the back of the restaurant—and then served with grilled asparagus and corn fritter cakes. When To Go: Visit in late spring to enjoy the first Copper River salmon, which start arriving from Alaska during that time. This colorful 24-hour Des Moines fast-food joint doesn’t offer a San Francisco–style Mission burrito—full of so much rice and beans and stuff, you can barely lift it—but it does make a pretty solid representation of simpler Southern California burritos, in which meat plays the starring role. Get the carne asada ($5.23) with guacamole and salsa. When To Go:: Taqueria-style breakfast burritos are inexplicably rare in these parts (not the same as the dinner versions), but California Burrito has them 6–11 a.m.
Kitschy and casual in all the best ways, this family-run Maple Leaf restaurant is owned by actor Yuji Okumoto, who you’d likely recognize from his breakout role as the villain in The Karate Kid Part II. But it’s the plate lunch, not the star factor, that keeps us coming back. 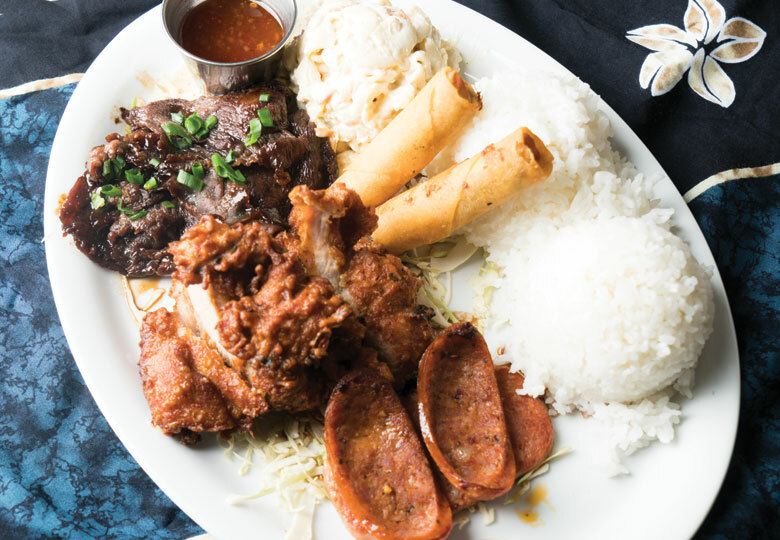 Get Da Kanak Attack plate ($13.79) for a little of everything: crispy fried mochiko chicken, teriyaki beef, Portuguese sausage and the requisite Spam, plus rice and mac salad, and not a vegetable to speak of. What To Order: Don’t miss the desserts: beautiful, rainbow-hued cakes supplied by Seattle’s resident Hawaiian bakery, Cakes of Paradise in Georgetown. The Northwest has no shortage of prized foraged foods, but few so sweet as the huckleberry, which bears a similarity to a small blueberry but is tarter and with arguably greater potential in baked goods. We’ve had them baked into pies and cooked down into compote, but the most reliable place to enjoy them is at Fremont bakery Sea Wolf, where Northwest-raised brothers Kit and Jesse Schumann bake the flavorful fruit (both fresh and frozen, depending on the time of year) into perfect croissants ($3.75). Know Before You Go: You won’t always find huckleberry on the short menu of daily pastries, but what fruit you do find—apple, rhubarb, whatever—is surely just as good. What sets Flintcreek apart from other steakhouses isn’t just the extraordinary vegetables (though house-made pickles with blue-cheese tahini sauce beats creamed spinach any day), but the intriguing selection of meats. In winter, that means elk steaks (market price): loin, New York, rack, whatever Montanan chef-owner Eric Donnelly can get. The lean meat can be difficult to cook, but Donnelly loves bringing new flavors to people, dressing the heavy iron flavor in a little lemon and anchovy. Find More: If trying elk is up your alley, but you’re looking for something more casual, head to Elliott Bay Brewing Company’s Lake City location for its cherry stout barbecue elk burger ($15). Like so many of the Northwest’s best dishes, it’s not about how you cook the trout, but where that trout comes from—which, in this case is northern Idaho. Seattle is a short hop from the trout’s origins, but Westward’s lakeside location and the whole fish ($27), roasted in the wood-fired oven, pay homage to the way Idahoans might eat dinner on a fishing trip. Sure, their fish may not be swimming in brown butter sauce with pickled cauliflower, smoked walnuts, capers and herbs, but that’s their loss. Where Else To Find It: The trout comes mostly through Mutual Fish Co., so head to the Rainier Valley fish market to try your hand at cooking it at home. Every burger joint in Utah keeps large amounts of the pinkish-orange fry sauce in stock at all times for dipping your fries, but once you’ve left the confines of the Beehive State, it’s rarely found. Admittedly, that might be because it’s just ketchup and mayonnaise, so anyone could make it at the table of most shops. But Herfy’s, alone in these parts, understands that somehow it just tastes better when it sits on the table, premixed, in a squeeze bottle, ready to welcome a dip of your crinkle-cuts. What To Order: The milkshakes are the other big hit here; they come in more than two dozen flavors, from banana to marshmallow ($3.49 and up), and staff is happy to mix flavors if you ask. Pastrami—brined, seasoned and smoked meat—usually brings to mind the high-stacked sandwiches on rye of New York City delis. But Barney’s in Everett imitates a version from owner David Barney’s native California (with Philippe the Original in Los Angeles being the best-known purveyor): lightly dipped, stacked with pickles, and smeared with mustard, on a soft roll ($10.25). Like the sandwich, the shop is the only one of its kind in the area: a tiny storefront frozen in time, littered with out-of-order gumball machines and decorated with photos of celebrities relabeled to share a surname with Mr. Barney. Find More: For a more mainstream style of French dip, the Wedgwood Broiler offers a simple but excellent version ($11.50) daily, plus a prime rib dip ($12.50) as a special much of the time.